June 12th will ever be printed in the minds of so many Nigerians as the day that politics and democracy was beaten by rivalry, jealousy and opinion. It's all about a man, known as M.K.O. Abiola who won the election hands down, but never spent one day as the president. In 1992, M.K.O. met a strange man, known as T.B. Joshua who prophesied the outcome of the coming presidential election. It is often said that when God talks, the wise listen. God often uses men as instruments of His wisdom. Why is this a lesson that many learn only in retrospect? If we could live our lives over again, what warnings would we heed? What advice would we ignore? An encounter with a true prophet of God can change the course of the history of one's life forever. What you are about to read is the narration of an encounter between the late Chief MKO Abiola and Prophet T.B. Joshua, as narrated by journalist turned businessman, Otunba Andy Anibor. F. C: Welcome to Faith Cometh. Can we talk to you sir? A.A: My name is Chief Andy Anibor. I am the Bobagunwa of Ilaro and a businessman. F.C: What is your relation with the Synagogue via the prophet? A.A: In 1992 when I was working with the Guardian Newspaper as Chief Correspondent, I was the one sent by the office to cover the launch of a vessel bought by the late business mogul Chief M.K.O Abiola in faraway Germany. When we returned to Nigeria, a relationship had begun and developed and he asked me to resign my position with The Guardian to become his (Abiola's) Protocol Officer. During that period, I had the opportunity of meeting the man of God and that was in 1992 when the church was still at its old site. I told him that I wanted him to meet my boss Chief Abiola who was contesting the presidential election. 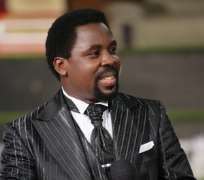 At about 8pm on that day, I and the man of God drove to the Chief's house on Abiola Crescent, Ikeja. The man of God, within ten minutes of the meeting, told Abiola that he was going to win the election but he was never going to be the President of Nigeria. Immediately, Chief called me aside and told me that this man was not an ordinary man, he asked me how I knew him and where he is from. I told him that the Prophet is from The Synagogue, Church Of All Nations. He said: “Where is Synagogue?” I told him that Synagogue is in Lagos, and he asked what he could do now? I told him to give the prophet money; maybe he could turn away the evil that would make his ascension to the exalted office of president, impossible. I came back to the man of God and told him that Chief says I should give him money. There was always enough money on me. I counted fifty thousand naira, but the prophet refused saying he had told Chief what was going to happen and that the only thing he could do to salvage the situation was for him to come to the church. I went back to the Chief and told him the message from the man of God and Chief said: ''Yes, he is a man of God, he should make me win instead of telling me to come to his church, he knows I am a Muslim''. He there and then told me that I should desist from seeing the man of God again and that he is too powerful for my kind of person, I should stay away from the Synagogue and that is how I abandoned my friend for several years. F.C: Prophet T.B. Joshua has been painted negatively in the press before the public so that one would think that everyone would keep their distance and here you are saying he is your friend. What informs this stance? A.A: Well at that time, my contact with the man of God was an act of God. He is very humane. We used to drive in my car to Oyingbo with the food in my car booth. It was a 'gazing watch' for passers-by who must have thought: 'Ah, what is wrong with this duo?' Here were people in their respective places of work and we prefer to share food to the destitute. We also used to go to motherless babies homes at Makoko, he would feed the children and for hours he would be in their midst. So, I came to like him until that event between him and Chief Abiola and the instruction to stay away. F.C: Were you surprised that he turned down the offer of fifty thousand naira even when it was obvious that he could do a lot with that sum in 1992/93? A.A: Before he rejected the offer, I knew he was not money conscious because I used to see a lot of money in his office. I knew it was not all about money. I knew he was not going to take it because he gives out more than that to those who seek his assistance. So, he not taking the money was not a shock to me. F.C: Looking back, do you not feel guilty for jettisoning your friend because your boss dreaded the truth? A.A: The man pays my bills and I thought he was actually going to be the president. I did not want to believe the man of God, not with the money, the connection national and international and the backing of the military and one man is saying he is not going to be there? I said to myself this man has only one vote, so I tried to follow the man that has been spending money, I thought we will win. Yes we did win fare and square, but the election was annulled. F.C: Why didn't you run back to the prophet? A.A: I remembered him quickly but it was too late because Chief had been arrested, so I had to run to my uncle Chief Kokori and told him that we have to help this man. He asked: ''If we have to help this man what of those who betrayed him?'' It is the cumulative events of that period that gave birth to June 12 struggle, NUPENG strike and other things that shook Abacha. At that time, I became angered that the man of God refused to help us after all I would have been living inside Aso Rock. So I did not want to come and see him again until recently. F.C: There were more prominent men of God who told Abiola that it was Eldorado and here was T.B. Joshua just coming up and he is saying the contrary. What can you say of Prophet T.B. Joshua? A.A: In fact, when you take a man to a big man's house, you expect him to say what the big man wants to hear and here was a young prophet who looked deeply into the big man's eyes and told him point blank that he was going to win but that he will never rule. We were all alone in the late Kudirat's apartment when he told him the message face to face. After that encounter, before the ugly events that unfolded later, Chief always taunted me saying: “Where is that your friend”, and I would say that I no longer go there, so I do not know much about him. I did not believe the prophet's prediction because with Abiola's weight and connection in society, nobody would have given the prophet's prediction a second thought because it has never been heard of in the annals of political history in Nigeria that a candidate wins an election and he is denied his mandate and here is a man, a year before the election, predicting that there would be annulment. I think that was why Chief warned me saying: ''You know, you are a small boy and these people are more than you. This man of God is not an ordinary man. He told me that when he shook his hand, he knew the prophet is not an ordinary man and that I should distance myself from the man of God if I wanted to stay with him but that if I wanted to go, I could go. I wanted to stay with Chief so I stayed away from the prophet. F.C: After the annulment was there anytime Chief Abiola in retrospect mentioned T.B. Joshua to you? A.A: After the annulment, a lot of prophets and pastors were coming and were trying to make him believe that the situation would change. I was all over the place busy looking for spiritual people who could work on Babaginda's mind to de-annul the election. Let me be frank, I was also scared of reminding him that there was a man who stood out against what others said because I was feeling that in his annoyance, he could say I should go and bring the man, alleging that he caused his failure, so I couldn't brace up myself to tell him of the prophet. But I think he still remembered because he once complained that he is not comfortable with these people because they were the ones who told him that he would become the president and now they are telling him that Babagida will die tomorrow. A few days later, security men picked him up and he never came back alive. F.C: Do you think over confidence and not religion informed Abiola's decision not to honour the prophet's simple instruction? A.A: Indeed he had on one occasion boasted that I should not mind the prophet, that either through the right means or through the back door he will be sworn in as the president. I think it is both factors but his confidence in his ability to twist things to his taste overwhelmed his judgement. F.C: T.B. Joshua is your friend and the friend of so many people. Why do you think people hold him high, now? A.A: There are so many factors responsible for this. I spoke about his humility, his lifestyle, for which many would mistake him for an ordinary man. Secondly, his magnanimity to those in need. Let me tell you that as I left service on Sunday, a friend called me all the way from London informing me that he just watched on the screen the church programme where according to him the prophet was giving out cash gifts to widows/widowers, dwarfs and after that the fellow said that unlike his pastor who cruises past beggars who lined the church path on service days but I told him that he has not just started the doling out of gifts, it is a thing he's been practicing over fifteen years now though at that time it was on a small scale, I mean financially. T.B. Joshua is a rare breed. In this era where pastors are amassing wealth for themselves and their families, going into ventures that are outside the confines of the sanctuary, here is a man who is sharing his wealth with the less privileged. Once in a lifetime, such fellows grace the earth and they are always true prophets of God. F.C: You still remember some of those pastors and prophets who prophesied falsehood, if per chance your path crosses theirs, what would you tell them? A.A: I know so many of them who will see me and take a duck because they knew then that they were after the man's money and told a lie against the Holy Spirit of God. If I am opportune to talk with any of them, I will point out one thing to them now, how they let themselves down and will warn them to shun crowd prophesies. T.B. Joshua was not a big pastor then, I mean compared with some big names at that time and yet he stood on the truth. See how God vindicated him as a true prophet of God.